The 7th Carole Nash Irish Motorbike & Scooter Show took place on March 4-6 at the RDS (Royal Dublin Society) Exhibition Hall with the organizers announcing attendance figures of close to 27,000; the same figure as the last show (in 2009) despite the ongoing economic situation in Ireland. This year, the decision was taken to expand the Affiliate custom show to offer two prizes of expenses to compete at the 8th annual World Championship of Custom Bike Building in Sturgis, one to the Irish “Best in Show” and the other to the winner of the International class, making the event one of only three ‘International Affiliates’ in Europe which offer two Sturgis prizes. One notable new exhibitor in Dublin was Zodiac International, who also supported the custom show with prizes totalling 6500 euro ($9000.00). Winner of the coveted Irish Champion accolade was Ger Conlon of C&C Choppers for his bike “Rattle n’ Hum”, based around a 1970 Shovelhead, modified to take two rear cylinder heads, with twin Webers on one-off stainless manifolds, with 4in one-off stainless stacks. The engine is also reversed, with a polished 6-speed Ultima gearbox turned around and mounted upright. The clutch is a modified Revloc running an open primary chain. The frame is a single-sided hardtail with eccentric adjusters for the friction drive, with the front end a mixture of inverted and springer forks. 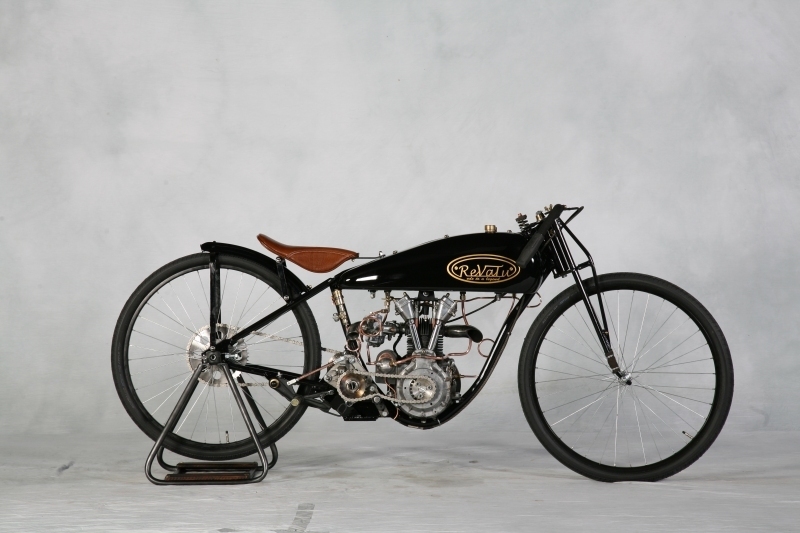 Conlon kept up a tradition of being involved in every winning bike since the show has offered a Sturgis prize, assisting Don Cronin with his 2009 winning bike and winning the 2007 prize himself with C&C partner Mick Creedon. The International prize was taken by Rene van Tuil of Revatu Customs for his peashooter “Ode to a Legend”. The bike is driven by a modified 1958 350cc w110 four-stroke single cylinder static water pump engine. Apart from the bicycle wheel rims and tires, every other part was either hand-made or modified by van Tuil, including the one-off board tracker-style single downtube rigid frame, reverse clutch, dummy magneto, 1 into 2 exhaust, crankcase breather valve and offset intake manifold, 8mm and 10mm copper oil lines, forks and yokes, oil and gas tank. The standard of bikes in the competition continues to improve each year, with a record number of international entries competing for prizes in the Modified Harley-Davidson and International classes. 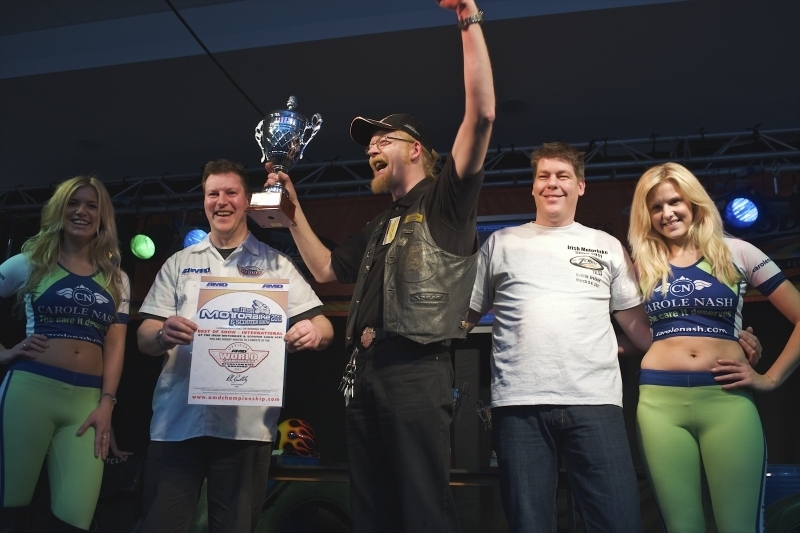 International bikes took all three prizes in the Modified Harley-Davidson class, with current World Champion Shaw’s Harley-Davidson placing first, with fellow UK dealership Warr’s Harley-Davidson runner-up. Lucky Buck Custom Cycles, also based in England, was third.